So here's my problem with the Dollar Tree, I go in there to pick a few items and come out with 4 bagfuls of great goodies! Did I actually save any money? 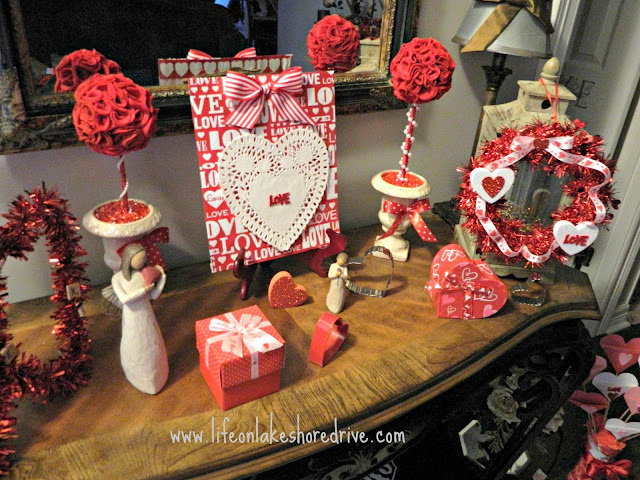 My hubby would definitely tell you no, but I have lots of fun stuff to decorate with. Actually we were on our way to dinner, and I told my husband I need to run in Dollar Tree for just a few minutes. Luckily, he knows me way better than that, and as long as he has his sports talk on the radio, he could careless except for the fact he was starving!! I tried to explain to him how much money I saved him, but he didn't buy that either. :) I always get in there and find so many cute little things for my classroom or just fun stuff to use around the house. I didn't get to finish half of the things that I purchased, but at least I have a great head start for next year! Sorry for the lighting on these photos. Normally, I have sunlight coming through the front door, but it has rained everyday since I've tried taking these pics. I am giving up on the perfect lighting and posting. Finally, lots of sunshine today!
. 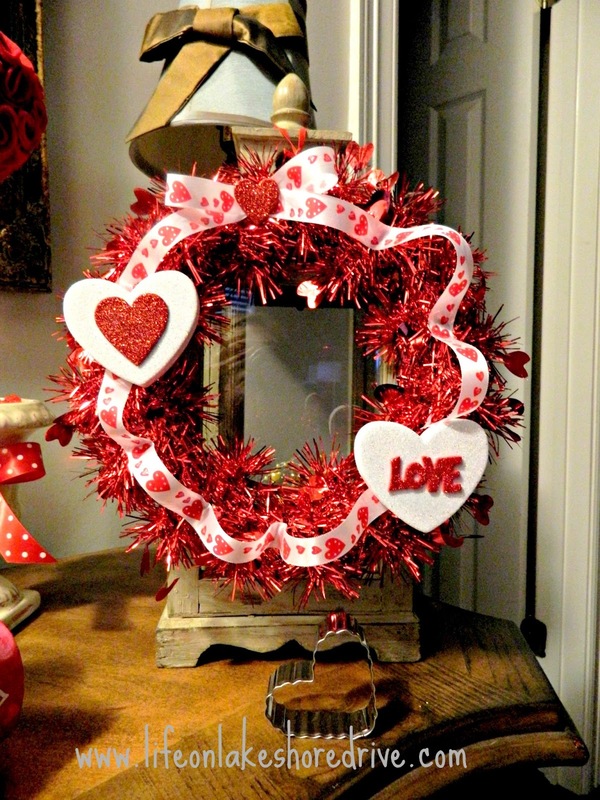 I made this cute little wreath with items that were all purchased at The Dollar Tree, except for the 2 large white hearts. They came from Wal-Mart. 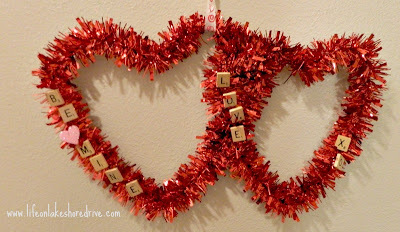 The Dollar Tree had lots of great Valentine's ribbon. 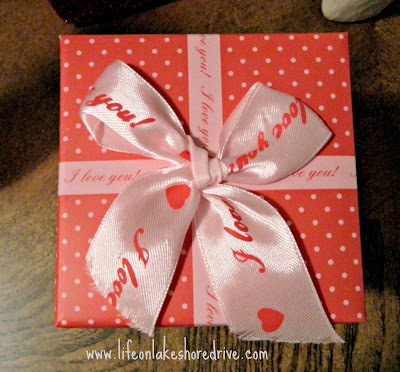 I love these adorable little gift boxes. They had so many boxes to choose from, but I restrained myself to just buying a few of them. 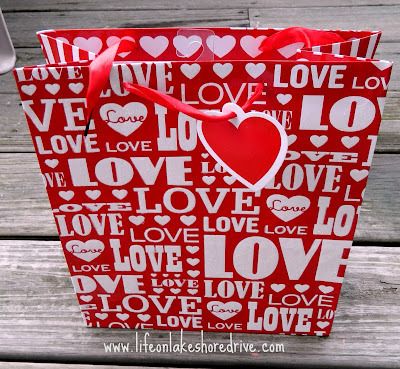 I loved all of the Valentine's gift bags. I decided to use my favorite one for decorative art background and use it for mini art photo. 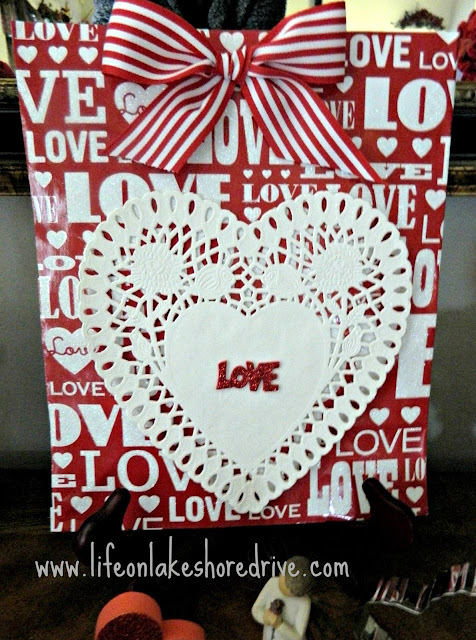 Even though you can't tell it from this photo, the Love words on one side have a sparkly texture to them. I cut out one side of the bag and glued heavy cardboard to the back of it to make sure it was sturdy. 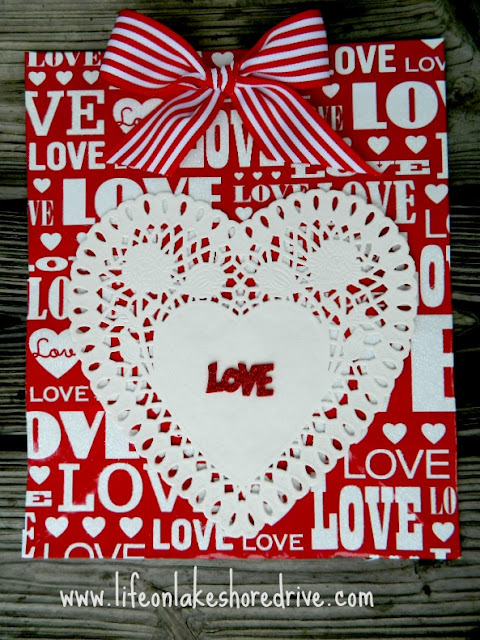 I added a bow to the top, and glued the heart doily on it. Then I added the little glittery love sticker to the center of the heart. So quick and easy. I should have taken a photo of all the things I purchased. Here is another wreath that I got started on, but haven't had time to finish. I'll pick up where I left off on this one next year. 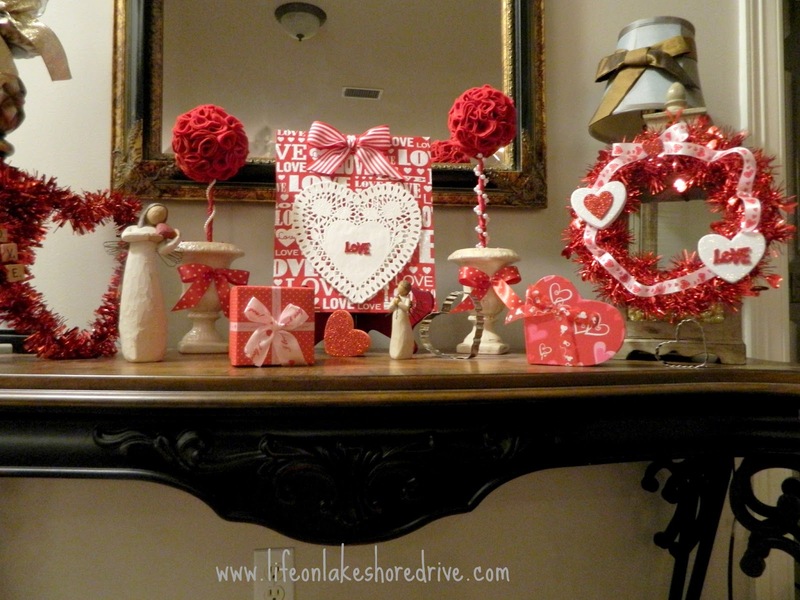 Thank you for stopping by and checking out my Valentine's decor. Much love and Happy Valentine's Day to you all!! Lovely projects! But I agree with you about Dollar Tree! I'd go in there and snicker to myself, thinking "how can they possibly make any money selling this to me for just one dollar?" Forty five minutes later, pushing my way out the door 3 bags heavy -and $23 lighter, I say,"ohhh, NOW I see how!" You had me laughing when you talked about your husband! 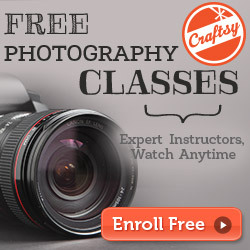 I think you will like my Giveaway! LOL!! Sweet...sweet, Kathy! Love your double wreaths with the scrabble tiles. 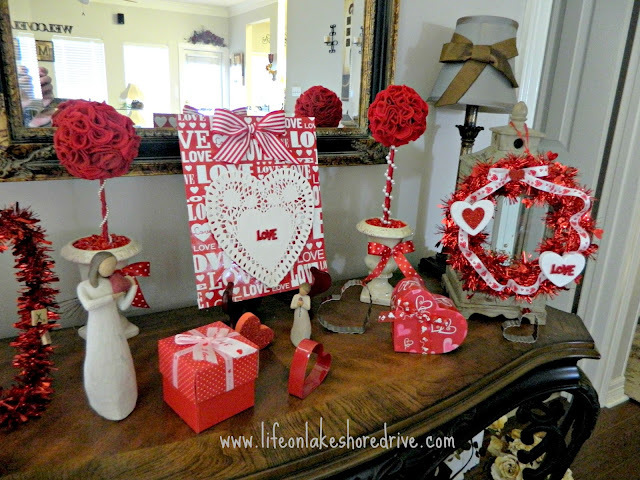 Don't you just love decorating for Valentine's Day? All of your vignettes are terrific. 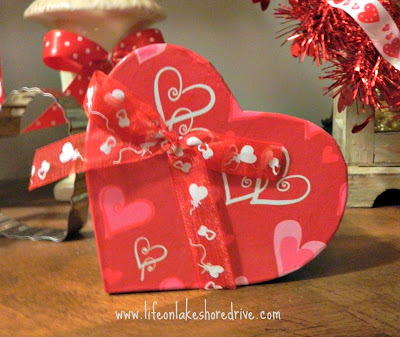 Happy Hearts Day to you! 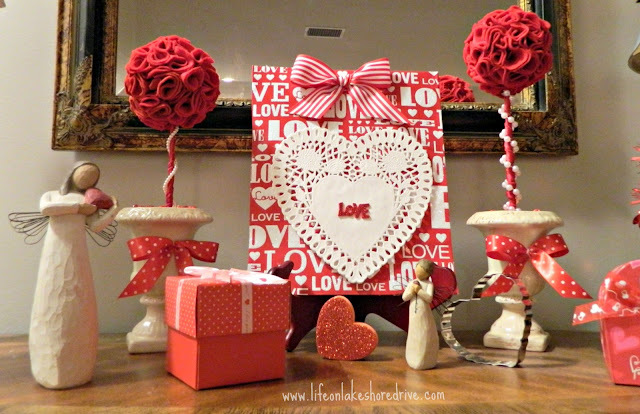 What a pretty Valentine vignette!So pretty! Funny my husband says anytime I spend money I am not really saving money LOL! Great vignette. Oh, don't you just LOVE the Dollar Tree? I bought several of the very same little box you picked out. 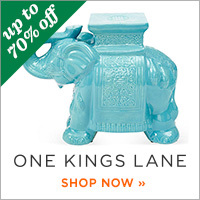 Nice for gifts throughout the year! So many cute things to decorate with at Dollar Tree! I love the little topiary balls. 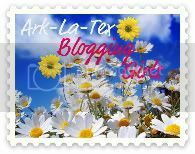 Thanks for stopping by my blog - I'm happily following you too! What a sweet vignette and so many creative ideas to pull from Dollar Store goodies. I love the gift bag idea! Love this mantle, so pretty. Thank you for sharing at my link party. Happy Valentine's my dear. So cute, but sweetie; I've always said that they got the name wrong. It's more like the $30 store. lol! Thanks for sharing with SYC. 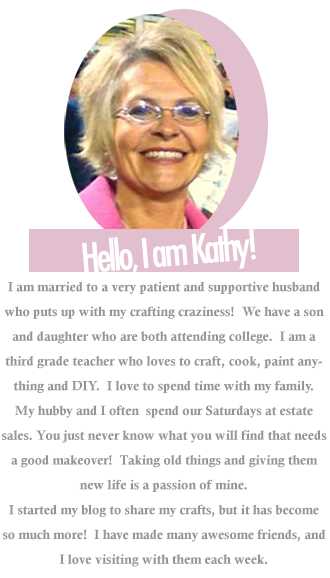 Kathy, Love the Dollar Tree too! So many great things for less. Thanks for sharing at Simple & Sweet Fridays. Beautiful! What a steal. The dollar store definitely has some treasures hidden on their shelves. 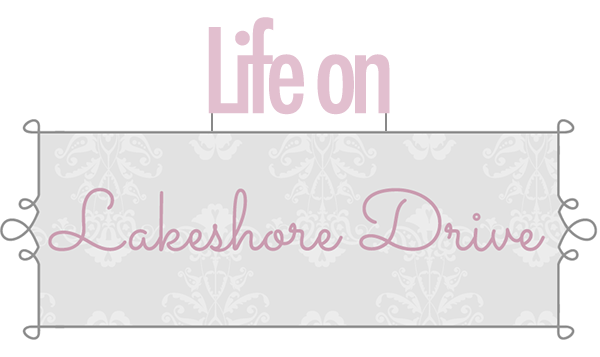 Following you back from the blog hop!